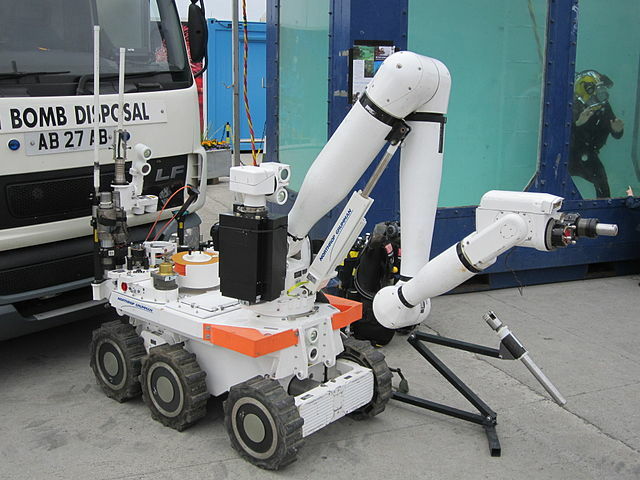 A common argument made in favor of the use of robotics to deliver (lethal) force is that the violence used is mediated in such a way that it naturally de-escalates a situation. In some versions, this is due to the fact that the “robot doesn’t feel emotions,” and so is not subject to fear or anger. In other strands, the argument is that due to distance in time and space, human operators are able to take in more information and make better judgments, including to use less than lethal or nonlethal force. These debates have, up until now, mostly occurred with regards to armed conflict. However, with the Dallas police chief’s decision to use a bomb disposal robot to deliver lethal force to the Dallas gunman, we are now at a new dimension of this discussion: domestic policing. Now, I am not privy to all of the details of the Dallas police force, nor am I going to argue that the decision to use lethal force against Micah Johnson was not justified. The ethics of self- and other-defense would argue that the Mr. Johnson’s actions and continued posturing of a lethal and imminent threat meant that officers were justified in using lethal force to protect themselves and the wider community. Moreover, state and federal law allows officers to use “reasonable” amounts of force, and not merely the minimal amount of force to carry out their duties. Thus I am not going to argue the ethics or the legality of the use of a robot to deliver a lethal blast to an imminent threat. What is of concern, however, is how the arguments used in favor of increased use of robotics in situations of policing (or war) fail to take into consideration psychological and empirical facts. If we take these into account, what we might glean is that the trend actually goes in the other direction: that the availability and use of robotics may actually escalate the level of force used by officers.